celer albums have this profound effect on me. the movement of oil on the surface of water. a sonic interpretation of incense smoke lifting and turning into the air. because the notion of physically surrendering waking mind to the passage of certain recordings is sometimes the only enticement i can find to draw me towards sleep, i've built over 40 playlists for sleeping, at least two of them largely celer based. the trick is that i can't sleep to celer if i need to be awake by a hard time; there's this turning inward, this movement through the body, this need for concealment, evaporation. sonic sedation. 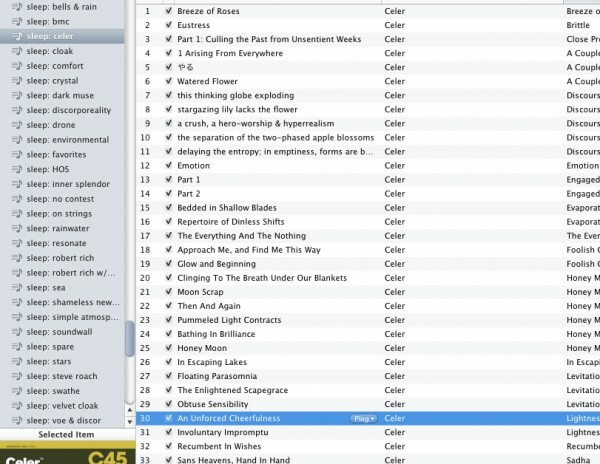 it's an indulgence, using the celer sleep playlist. it's too potent for me if i'm not prepared. what's funny is that after more than two decades of exploring drone, ambient music, field recordings, binaural beat and the impact these sorts of sound can have on the mind, that the impact celer has on me is somehow surprising. the biopsy required four entries instead of the one i was expecting; i'm not sure why, but i thought the anesthetic would be administered topically. i winced at little at the anesthetic needle. the edges of things blurred. the office was small and mostly occupied by the sonogram machine. there were posters on the ceiling of puppies and tropical islands. comfort images you'd order for a dollar from the newsprint book catalogs you got every few weeks as a school kid in the eighties. i had one of men and ancient sailboats silhouetted off a coast in africa, a long time ago. it had a pleasing stark grain about it. i remember staring at it for hours and still wonder what happened to it, sometimes. next to the puppies and islands, there was a translucent panel in the drop tile with dolphins. rounded and pastel, very mid-nineties. i wonder when i started identifying objects in my immediate environment by the decade in which they were most likely made. so the doctor stuck needles into my neck for five minutes. i experienced "slight discomfort." she put a skintone non-latex bandaid on it that was so dark in contrast with my skin - which is, as they say, maybe two shades off from 'total absence of melanin' - that i felt like everyone we encountered must have had their eyes drawn right to it. ben and i had noodles for lunch. we went home. i got a copy of bhanu kapil's the vertical interrogation of strangers for my birthday. or, rather, i got an amazon gift card for my birthday and that was part of what i ordered. this is the sort of writing i wanted to do. i page through it and can't even read, it makes me feel so barren. instead i've been re-reading lowry's anastasia krumpnik series, my favorite books as a child, the series that inspired me to try writing myself. when i started reading, i was the same age as anastasia in the first book; now i am two years older than her mother. ben's mother has been listening to the same pointer sisters song on the downstairs stereo every day at 6:30 for the last week. i wonder if she realizes this. i don't seem to have a lot of thriving in me, lately. she said about 7 days. oh crap! i just typed out a kinda long response and then it got eaten. i am about to fall asleep - trazodone has worked. i wanted to say though that i am so glad the biopsy is over, and am hoping results will quickly return. also, maybe could we trade cds sometime? i would really love to hear your sleep playlists (not all 40, don't worry! just a few?) bc i use playlists like that too. i love your noting the age of anastasia & you at your first read, contrasted against the age you are now, and that it is closer to a different character now. what are those books called? i mean, the titles? i wonder if i did read them. sending love. i have to go to bed. alice's birthday party is tomorrow. nothing is ready. lois lowry wrote most of the anastasia series in the eighties. one of my gradeschool teachers read the first book to us in the fifth grade and i headed right to the library so i could read the next ones in the series. she said "you're a lot like anastasia," which made me deliriously happy. they're very fun and insightful. might be something to think about for alice, when she's a little older. i've been meaning to have ben read them, but the copies i have access to are all in my kobo, so this might have to wait for now. i would love to trade cds with you, but if you haven't figured it out... i am TERRIBLE at mailing things. i still have socks and a mix for you. i hope that alice's party went well, dear one.